William Curson - THE MASSACRE AT LE PARADIS - HELL IN PARADISE - MAY, 1940. 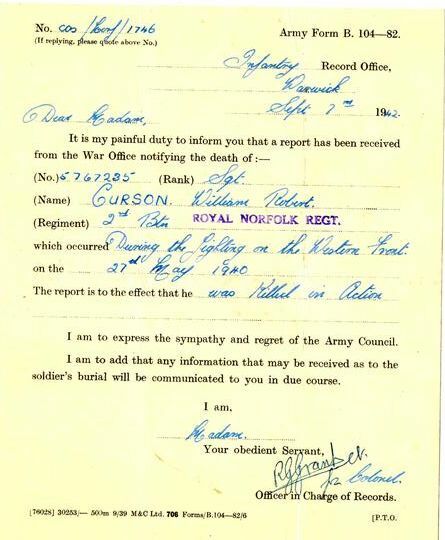 Sergeant William Robert Curson. Died 27th May, 1940, aged 33. Inscription reads "Dearly loved husband of Barbara. 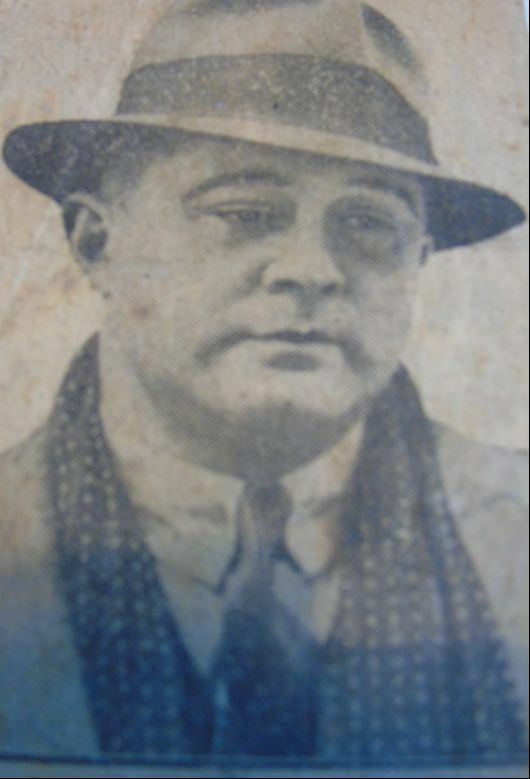 Daddy of Phyllis and Philip. 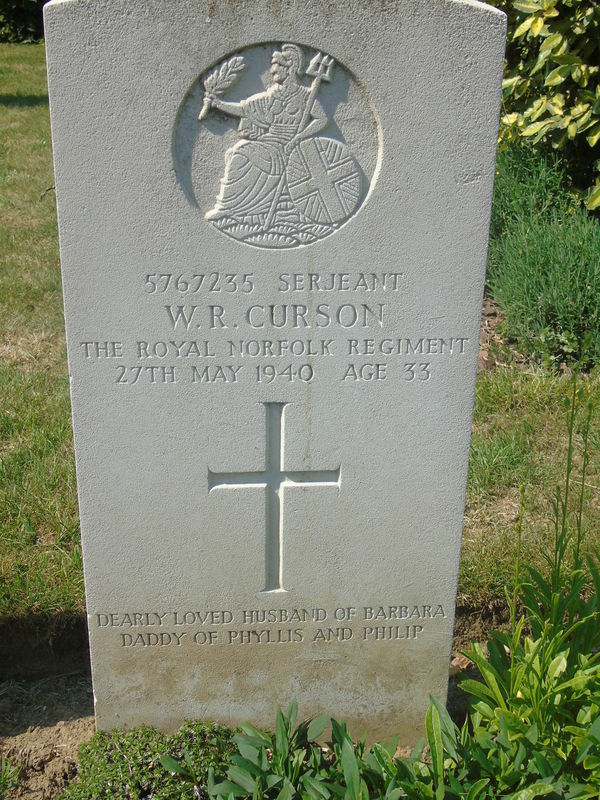 ​Son of Robert and Beatrice Curson; husband of Barbara Phyllis Curson, of Stibbard, Norfolk." He is also commemorated on the Stibbard War Memorial (pictured left). 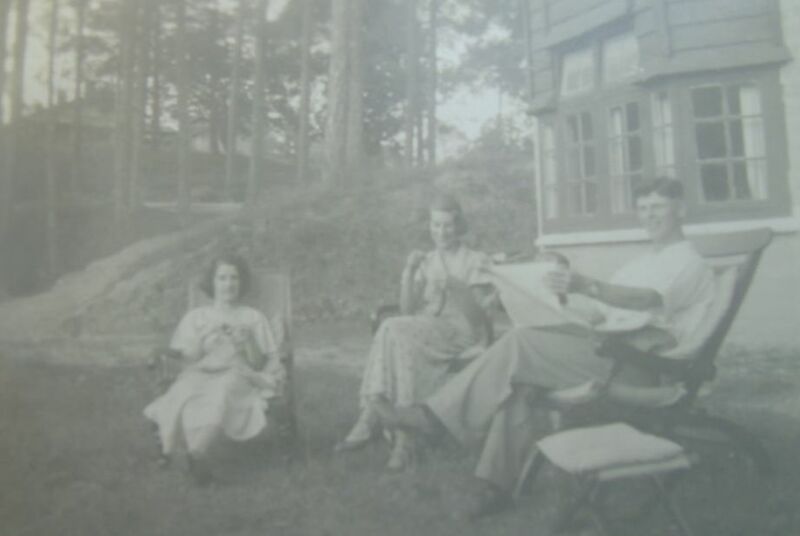 Son Philip and daughter Phyllis were just over a year and three years old when their father died and had no direct memory of him. 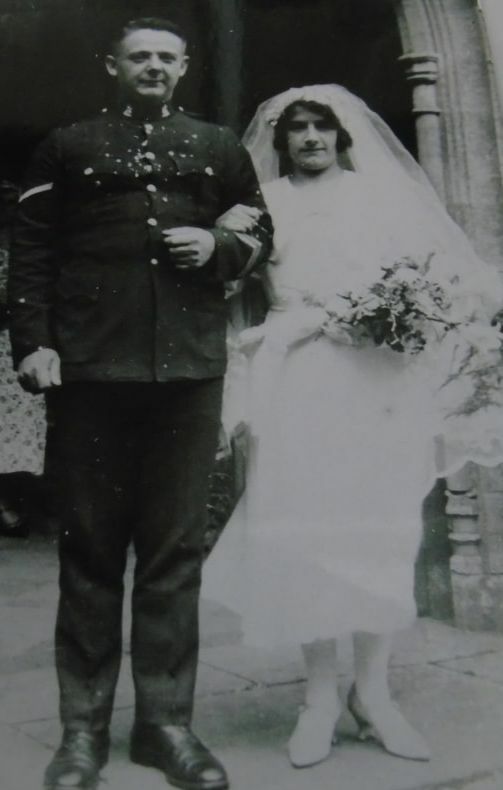 Over the years, with the help of wife Jean and son Peter, Philip has been able to piece together a number of details of his father's life including the fact that he lied about his age in order to join the Royal Norfolk Regiment. William's son Philip pictured at his father's grave in Le Paradis Cemetery in 2015. 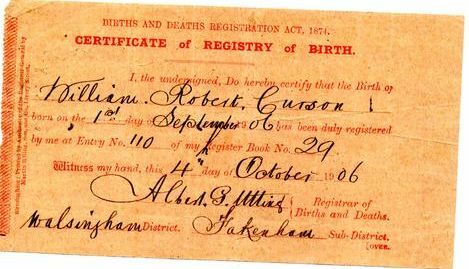 William Curson was born in Great Ryburgh, Norfolk, on September 1st, 1906. 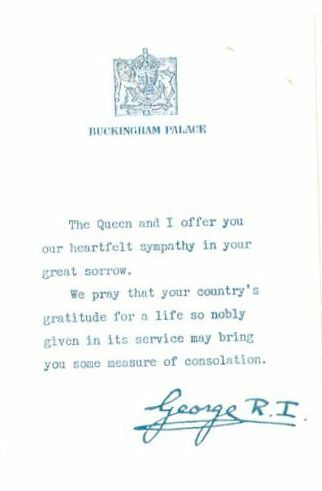 He was the son of Robert and Beatrice Curson (nee Barnes). William enlisted in the Royal Norfolk Regiment at Britannia Barracks in Norwich on November 6th, 1922, when he was just 16 years of age. He gave his birthday as September 1st, 1904, adding two years to his age and passing himself off, as many others did, as 18 in order to join up. "I think my father was something of a joker and he obviously added two years to his age as he went up Kett's Hill," son Philip said. The minimum age for young men to sign up was 18 and wasn't lowered to 16 until 1942 and that had to be with parents' consent. 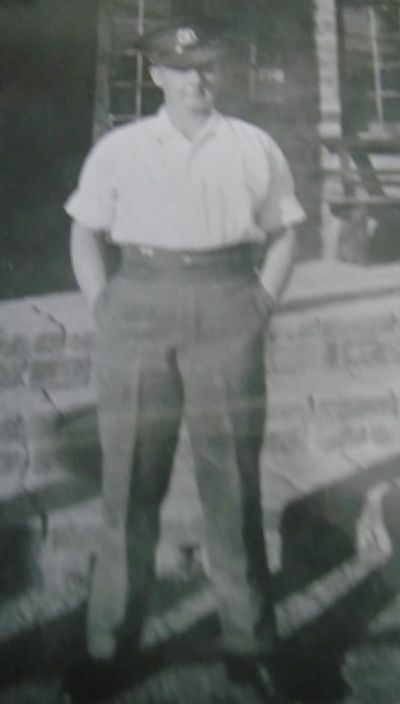 Sixteen-year-old masquerading as 18-year-old William soon settled down to army life and saw service in Jamaica (September 6th, 1923 to September 19th, 1925), Egypt (October 12th, 1925 to November 15th, 1925), Cyprus (November 16th, 1925, to October 7th, 1926), Egypt again (October 8th, 1926 to October 11th, 1928), China (November 6th, 1928 to November 14th, 1928) and India (November 15th, 1929 to February 29th, 1936). 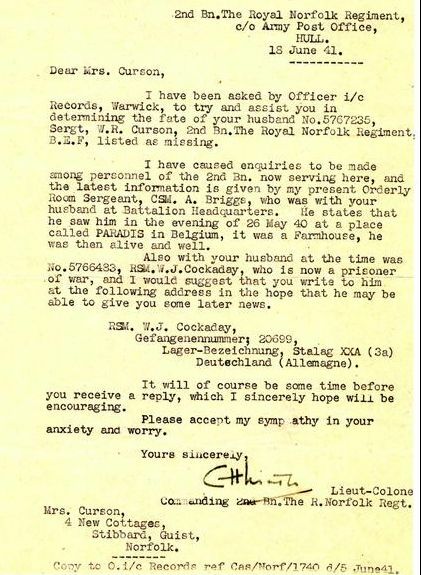 His records then become sketchy but it is known that he had a period of home leave and further service before serving with the British Expeditionary Force in France from 1939 until his death at Le Paradis. He rose through the ranks rising to that of lance corporal, corporal and eventually sergeant. William married Barbara Phyllis Nobes on July 30th, 1932. Philip Curson was born on April 11th, 1939, just 13 months before his father died. The family were living on the main road at Stibbard when Philip was first told that "daddy wasn't coming home." Philip remembers going into his mother's room where he found her and his sister crying. They had just received confirmation that William had died. 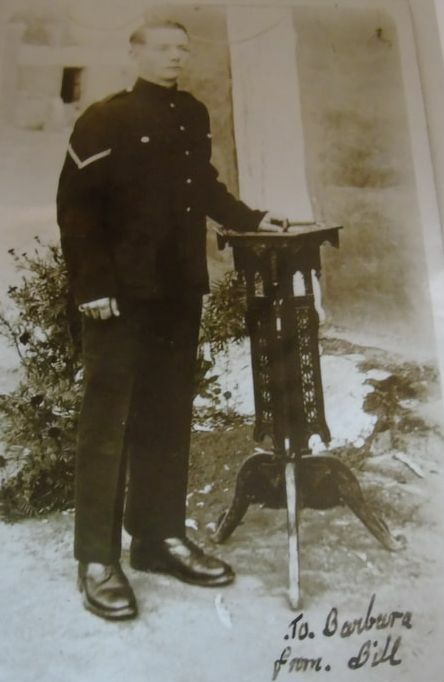 "I know that for a time my sister posted letters to him but they were intercepted by the local postmaster who knew that he had been killed fighting in France," Philip said. 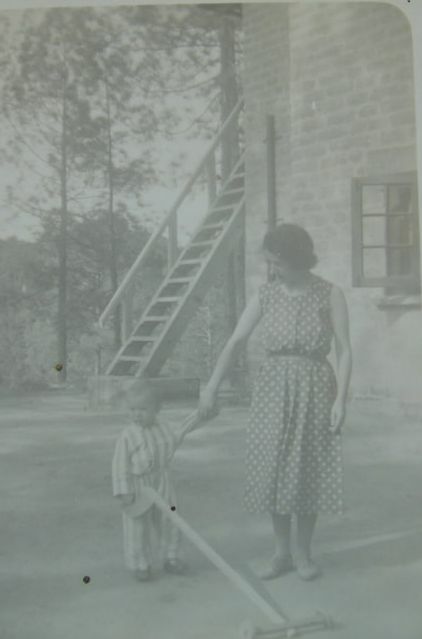 "She was very ill, but we believe she was waiting for the massacre day," Philip said, adding that he only remembers his mother mentioning that his father had been killed in the war on one occasion. "I built up this picture in my mind and only found a few details. I know that he was only about 5ft 4in tall but was physically very strong. I am very proud of what he was and what he achieved," Philip said. 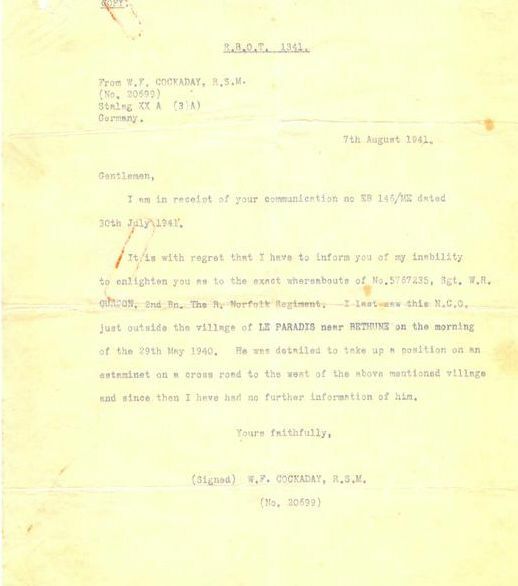 Philip is convinced that his father was killed in the massacre and may have been a "walking wounded" having been hit during the fighting that took place before the surrender. Philip himself was conscripted into the army without, at the time, knowing exactly what had happened to his father. Ironically he was posted to the German capital of Berlin as a dispatch rider, moving between the various zones of occupation imposed after the end of the Second World War. ​"It was a good posting but I'm glad I didn't know what had happened to my father at the time. I'm not sure how I would have felt if I had known what the Germans had done to him," Philip said. The photograph opposite shows what is thought to be William Curson's original grave. 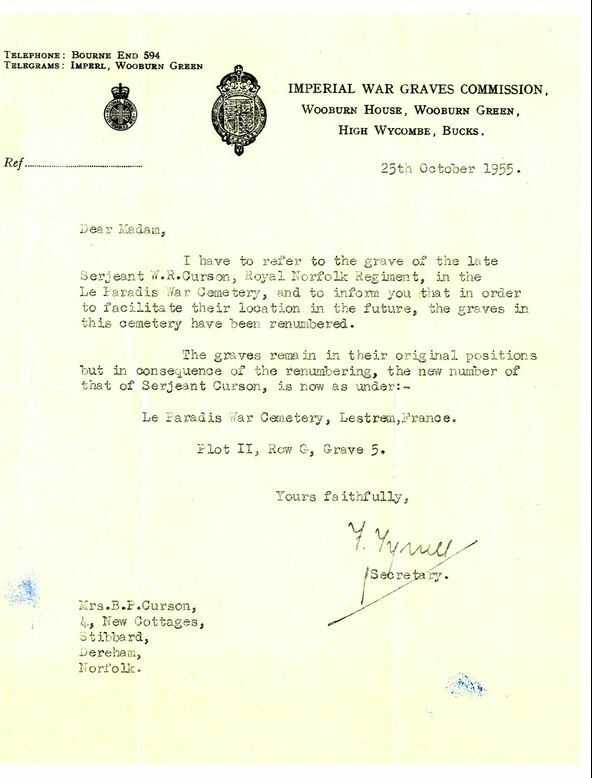 While records show that exhumations took place at the barn in 1942 and reburials were at Le Paradis, William's son Philip thinks his father was initially buried at the barn as identified opposite and exhumed much later. ​There would not have been much interference with farming activities as Philip stated the barn was unoccupied when he first went to Le Paradis in 1990. 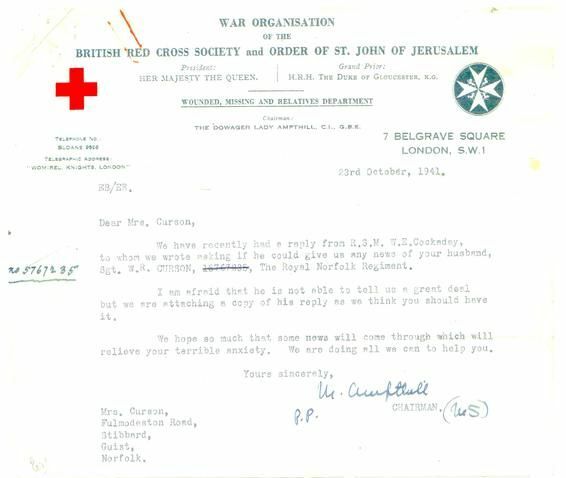 FOOTNOTE: William Curson's brother, Robert Stanley Curson, was in the Navy and in 1944 was mentioned in dispatches and made up to Acting Petty Officer having taken over a gun when the gun crew were killed. 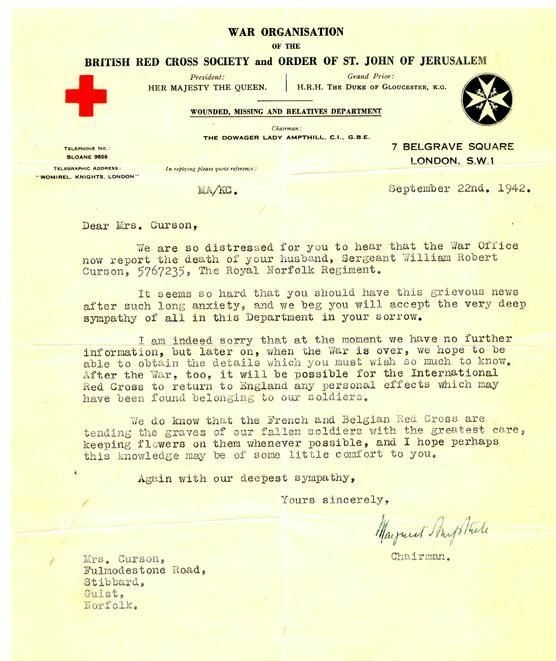 The documents, letters and photographs below are from the collection of Philip and Jean Curson and are reproduced by kind permission of the Curson family. 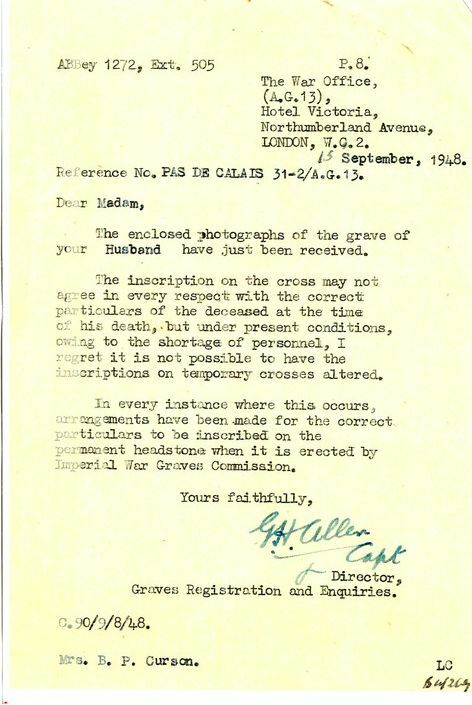 Click on the photographs and documents to enlarge them. 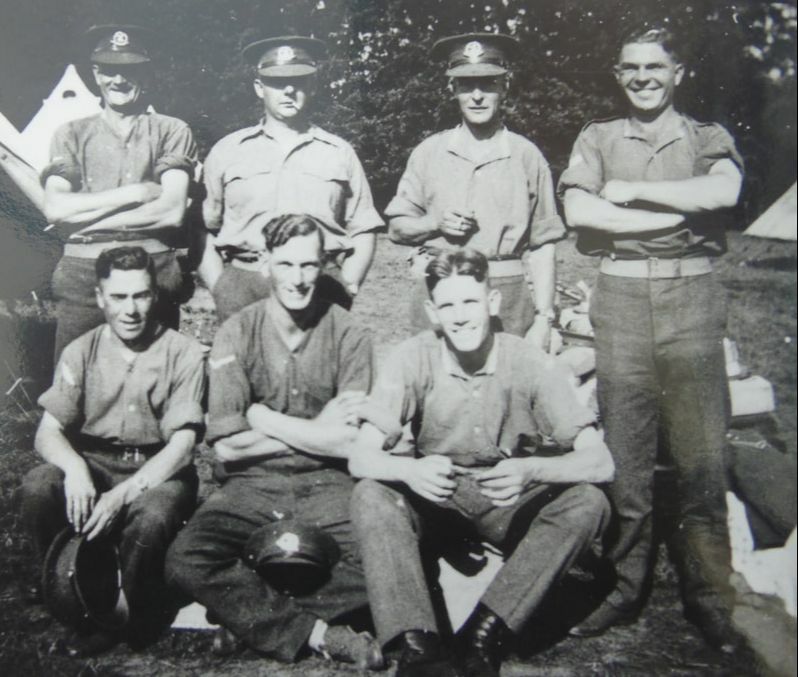 William pictured with fellow soldiers. William with colleague probably taken in India. William as a Lance Corporal. William on his wedding day to Barbara. 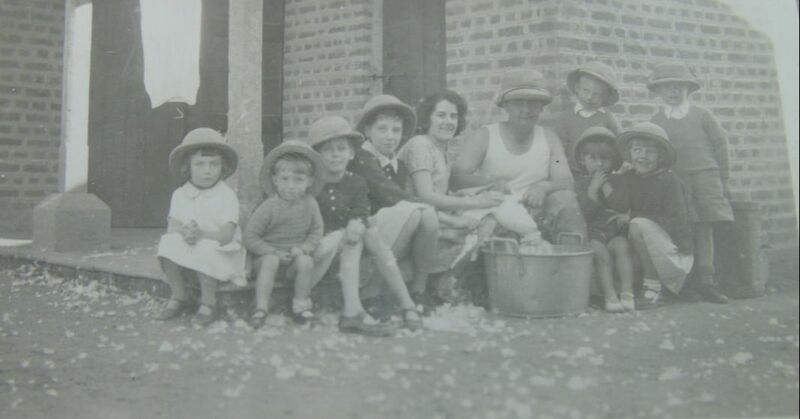 Barbara Curson with children - possibly taken in India. Barbara Curson with young friend. ​Philip has identified his father in the 2nd Battalion Royal Norfolk Regiment photograph above which was taken in September 1939 as third row up and third person in from the right hand side. Notice the stripes on his arm. 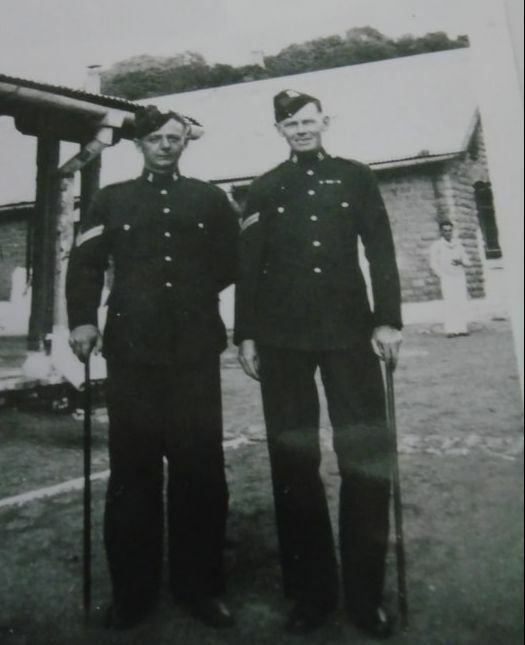 In the book "The Vengeance of Private Pooley" by Cyril Jolly on page 41, there is a reference to a soldier who lay across the right arm of Bill O'Callaghan: "across his legs lay one of his comrades and on his right arm a Regimental Police Sergeant. 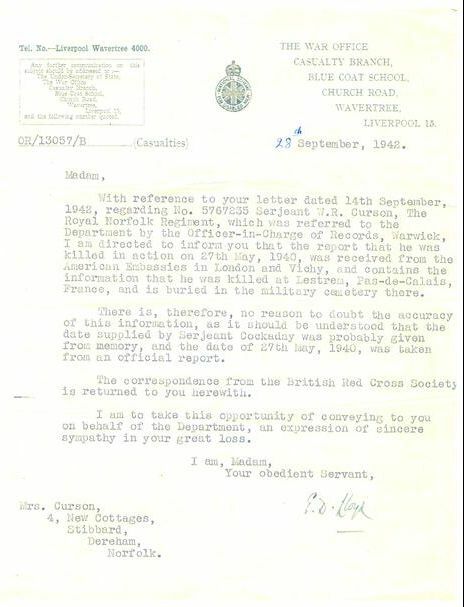 William Curson was a Regimental Police Sergeant (a provost) and Philip Curson believes this was a reference to his father. It is likely there would only be one RPS in a Battalion. If there were more than one then it would be incredible that they survived in what remained of the 2nd Battalion of the Royal Norfolks. Captain Charles Long estimated on the final day that there were 100 left (officers and men) of which 50 were in C company and out of contact.